The sort of breakfast that's good before you go surfing, after you've been surfing, or if you have no intention of ever going surfing. Serve with fried eggs for the complete package. Heat the oven to 180C. Drizzle cut tomatoes with 1 tbsp olive oil, scatter with thyme and rosemary and bake for 15 to 20 minutes until soft. Place the bacon or prosciutto alongside and bake until crisp, about 10 minutes. Combine the drained beans and tomatoes in a pan. Add brown sugar, Worcestershire sauce, tomato sauce, dried chilli, sea salt and pepper, 1 tbsp olive oil and 200ml water and simmer, stirring occasionally, for 15 minutes until thick. Stir in the parsley. Heat the grill. Toast the ciabatta, then rub with cut garlic cloves and brush with 1 tbsp olive oil. Place cheese on top and return to the grill for 30 seconds until cheese softens. 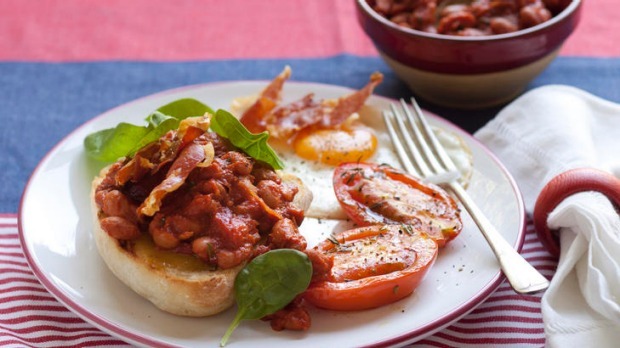 Top each ciabatta with a spoonful or two of beans, a few spinach leaves and roasted tomatoes. Fold the bacon or prosciutto in two and place on top. Drizzle with remaining olive oil and serve with fried eggs.